Who said that a honeymoon must be a boring affair of swinging legs and cocktails on a blissful tropical beach? We certainly say NO: I and Kit married in 2017 in Italy, at the end of an overland hitchhiking trip from Tehran to Ankara in Turkey. We love travelling so much that we hit the road even TO GET TO OUR OWN wedding. But we also know that not every couple has the luxury of time, and that most can only travel to far, exotic places on their honeymoon – unless they make the best out of couple travel deals. Which, regardless of your background, can be both a very luxe AND adventurous affair, especially in the amazingly varied continent that is Asia. This post is intended to help all those adventurous couples who are planning their honeymoon. We help you choose among the top honeymoon destinations in Asia, so that you can spend a perfect first romantic holiday. We have collected detailed information from the best honeymoon places in Asia, and we went well beyond the usual suggestions of touristed honeymoon destinations in Southeast Asia. So pour yourself a drink and sit back comfortably, for this mammoth post has everything you need: from gaping at Everest Base Camp to experiencing the seas and volcanoes of Indonesia; from the jungles of Laos, Malaysia and Cambodia, to the ski resorts of Iran and the peaks of Georgia and Nepal. We’ll give you a smorgasbord of options to choose among the best honeymoon destinations in Asia, find the perfect match to your needs, and also bring a sparkle of adventure to your first trip as husband and wife. Otherwise, you can always stick to some of the world’s trusted honeymoon spots. To have the widest range of experiences and opinions besides our own, we have asked some of the world’s best travel bloggers (thanks friends) to chime in with their top suggestions, and have rounded up the best 22 honeymoon destinations in Asia for adventurous couples. But let’s start with OUR OWN honeymoon experience in Asia… which really was a special one. The stretch of Pacific ocean between Papua and the Maluku islands of Indonesia may as well be one of the least visited in the world. We set off on Tiger Blue, a beautiful wooden yacht built in the traditional Makassarese style — now a UNESCO intangible heritage — following the last returning route of the early adventurer, writer and biologist, Alfred Russel Wallace, from Waigeo (where the famous diving sites of Raja Ampat are) to volcanic Ternate. We sailed for 12 days, pampered by a tight-knit crew and expert chefs, spending our days diving with sharks and manta rays, snorkelling off viridian waters and unspoilt coasts dotted with villages that have changed very little from the time Wallace was here, about two centuries ago. Beside sailing next to packs of dolphins and pilot whales, we saw the birds of paradise and touched on tiny islands where one still has to seek their headsmen’s approval prior to set foot on shore. It was a dream trip, the perfect balance of unending adventure and luxe comfort to suit the perfect honeymoon. 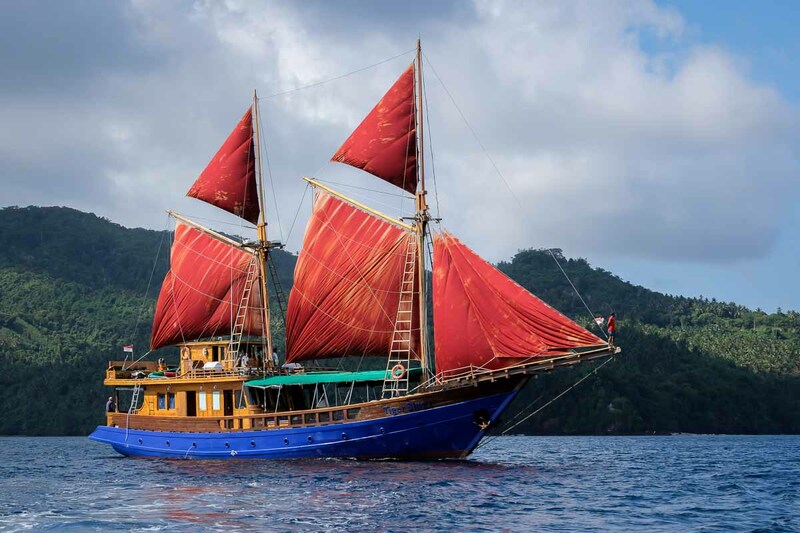 Tiger Blue, like other private yachts sailing in Indonesian waters, organize all-inclusive cruises in either Raja Ampat, Komodo, or the Maluku islands. Airport pick-up and drop off, all meals, and accommodation in two people en-suite cabins are included. You can join one of their set departures, priced from about $2000 all-inclusive, or charter the whole boat for a maximum of 12 people. In the latter case, you can customize your route and get to places where very few people have. Bagan is a small place, and most temples and pagodas are a short drive between. I spent two days exploring the ancient buildings, while I think that was enough time for me, you can easily spend a week visiting the much smaller sites. For an adventurous honeymoon, Bagan in Myanmar is an explorers dream come true. Bagan is home to over 2000 ancient temples, pagodas, and stupas. Many of these structures have been forgotten and lots are now known by a number rather than a name. Hiring a motorbike is the best way to temple hop around Bagan. While there are private guided tours available, rented an electric motorbike and driving deserted dirt roads provides an experience like no other. 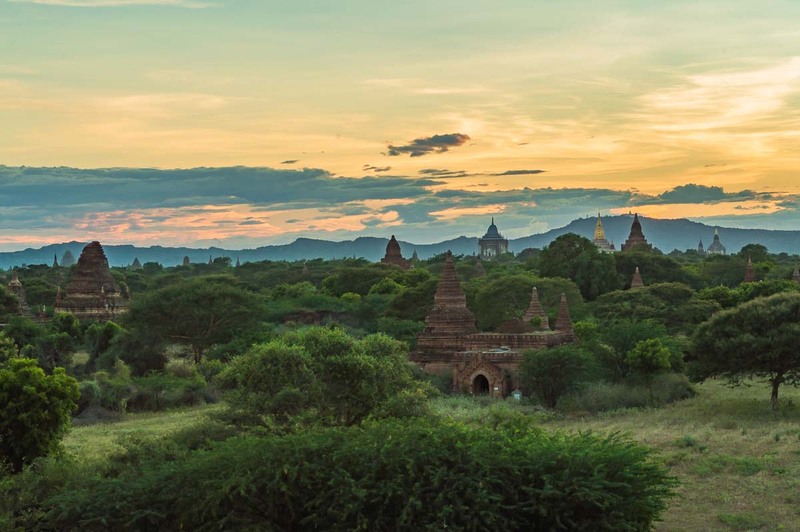 While there are definitely “must see” temples in Bagan, exploring the lesser known, even forgotten ancient structures is where the adventure becomes unforgettable. Dirt roads weave around red brick buildings. These trails are bumpy and usually unmarked. There’s the real possibility to get lost in this winding rural network. But that is half the fun! If you’re after a view of the flat horizon and man-made peaks, taking a bit air balloon ride is another activity Bagan is well known for. Bagan is a perfect place for an adventurous style honeymoon. Exploring temple and back roads with no one in sight is a memorable thing to do in Myanmar. Taiwan is an underrated destination that not many would think of “cycling”. But the country has made it easy for everyone to try a cycling tour thanks to the home-grown brand Giant and a sprawling network of dedicated bike paths. I believe that cycling Taiwan’s East Coast from Kaohsiung to Hualien is a fantastic way to spend an adventurous honeymoon in Asia. The mountain slopes that roll right down to the coast, with coconut trees set along the shore, and an attractive coral reef just offshore, are what make this trip an incredible choice for an adventurous honeymoon. You will come across the enormous variety of typical Taiwanese street food, which perfectly demonstrates why the island is so famous for its food culture. 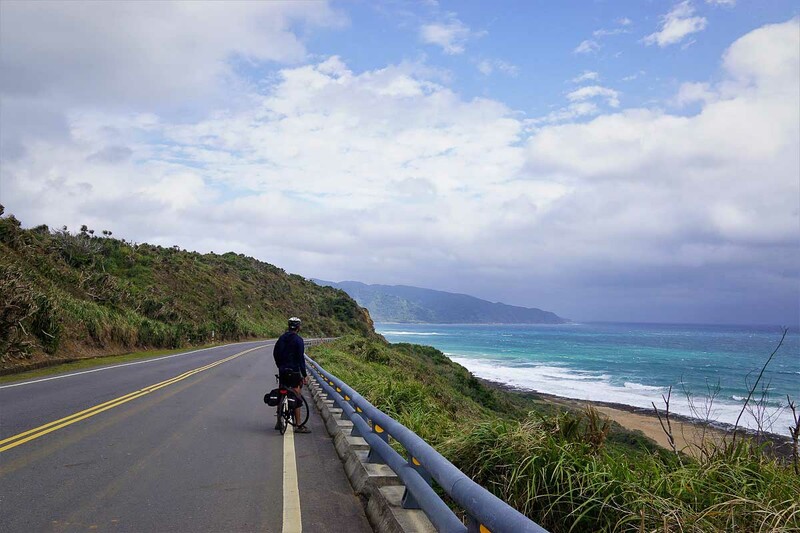 It was in the southernmost tip of Taiwan, Kenting, that we found some of the most remote and exotic beaches, perfect to kick back and relax after a hard day toiling on the bikes. All you need to do is follow the coastal route from Kaohsiung all the way to Hualien. It’s 445km and takes about one week to complete. You can rent your bicycle from any Giant shop in Kaohsiung. Don’t forget, on your second night, to stay at Tiny Greece in Fangshan, with its views that rival the famous island of Santorini. This place was rated by couples as one of the best places to stay in Taiwan. Despite being considered the ultimate romantic and holiday destination, the Maldives has a lot to offer to people in search of a bit of adventure. It’s the kind of place where couples on their honeymoon can spend one day chilling at the beach or admiring the sunset from their overwater bungalow while sipping a glass of chilled champagne, and go diving, paragliding and even surfing the next day. In fact, one of the top things to do in the Maldives is diving. The clear, warm waters are packed with marine life and many species of colourful fish and corals, and the best part is that in some islands the reef can be easily reached from the shore. Most resorts offer diving expeditions. Some have their own diving center, others cooperate with diving centers around the archipelago and organize diving expeditions where customers get training before getting in the water and are provided all the necessary equipment. While diving is available pretty much anywhere in the Maldives, good waves are not everywhere. The best place for couples who are keen on riding the waves is the North Male Atoll. Adaaran Select Hudhuranfushi is a great resort that offers a wide range of adventurous activities and where the waves are excellent. Couples can easily spend a week there, alternating a day of fun and adventure with one relaxing in the resort. 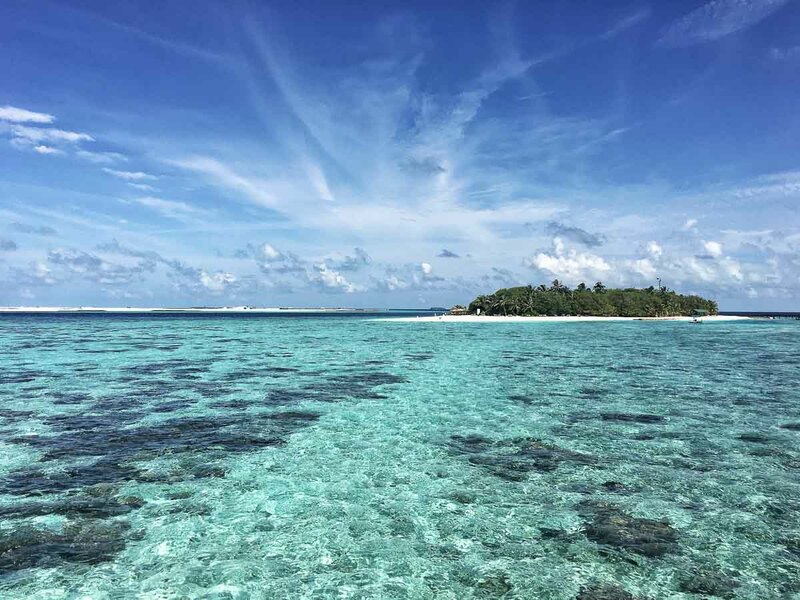 Guests staying at Adaaran Select Hudhuranfushi are usually picked up by the resort, who organizes a chartered boat directly from Male airport. It takes around 45 minutes by boat to get there. Tilicho Lake is one of the highest lakes in the world and is known for being the largest lake at such a high altitude. It sits at 4,919m (16,138ft). While the lake itself is just a lake, the journey to get there is one hell of an adventure. The starting point is a six-hour bus ride from Kathmandu or a four-hour bus ride from Pokhara. You’ll need to trek for days in the Himalaya and work your way over multiple landslide zones. If you’re lucky, you’ll even see an avalanche in the distance. While it takes days to arrive, the final hike up to the lake is done at sunrise. Nothing could be more magical than seeing a million beautiful stars in the darkness followed by a sun rising over the Himalaya. If you’re not an avid trekker, I’d recommend getting a guide to take you since you’ll come across some dangerous situations on the route. If you do have experience, then it’s not too difficult to navigate on your own. Depending on your starting point (some people walk while others take a jeep), the trek can be done in as little as 6–7 days. While some people hire a jeep from Besi Sahar to Manang, I’d recommend a slightly longer route starting at Besi Sahar and walking all the way to the first major location. This will ensure that you acclimatize to the altitude properly, and also will give you more insight into the local culture. It costs between $25 and $50 per day depending if you get a guide or not. The major villages to stay in are Manang, Shri Kharka, and Tilicho Base Camp. It’s approximately 2–4 hours of walking a day, however, the day you trek to the lake is about 8 hours. Camping is not necessary since there are teahouses (basic hotels) to stay in on the route. You’ll get to see Nepali culture up close, explore the Himalaya, overcome landslide prone areas, and wake up to the most spectacular view in the world. At the end of the day, you can snuggle up with the one you love while drinking some famous masala tea. As a scuba instructor, I have completed over 2,000 dives in Southeast Asia alone. I have seen some incredible marine life in the Coral Triangle, but Wakatobi’s marine reserve was home to some of the most pristine, vibrant and untouched corals I had ever experienced. For any scuba or ssnorkelling enthusiasts, Wakatobi’s underwater wonderland is an ultimate dream come true. Aside from the world-class marine life, Wakatobi Dive Resort is a luxury dive resort like no other. Located on a paradise island far removed from civilization, you can enjoy some 40+ dive sites without sharing them with anyone else. After a day of phenomenal diving/snorkelling, you can unwind at the jetty sipping on cocktails as the sun sets over the horizon, gaze up at the breathtaking milky way, indulge in heavenly massages or head to the on-site restaurant for exquisite cuisines. Wakatobi Dive Resort is accessible on a 2.5-hour private charter flight from Bali, which departs 1–2 times a week. A seat on the chartered Garuda can range between USD 600–800 (roundtrip) depending on your package. You can design and book an all-inclusive package (including transportation, accommodations, food, and activities). Once you arrive at the private airport on Tomia island, you will be whisked away to the resort island where you will spend your honeymoon being pampered above and under water. To explore all the diving/snorkeling that Wakatobi has to offer, I’d recommend that you stay a minimum of 5 days. Believe me, you will never want to leave this paradise! Jeju Island is South Korea’s most exotic island and is a popular honeymoon destination for newly wed young Korean couples. The island is the perfect honeymoon destination as is has such a variety of activities to offer, perfect for all types of couples. The island is easily accessible by plane from all major cities in Korea or South East Asia. From Busan, the island can be reached by boat, which is a rather nice experience. 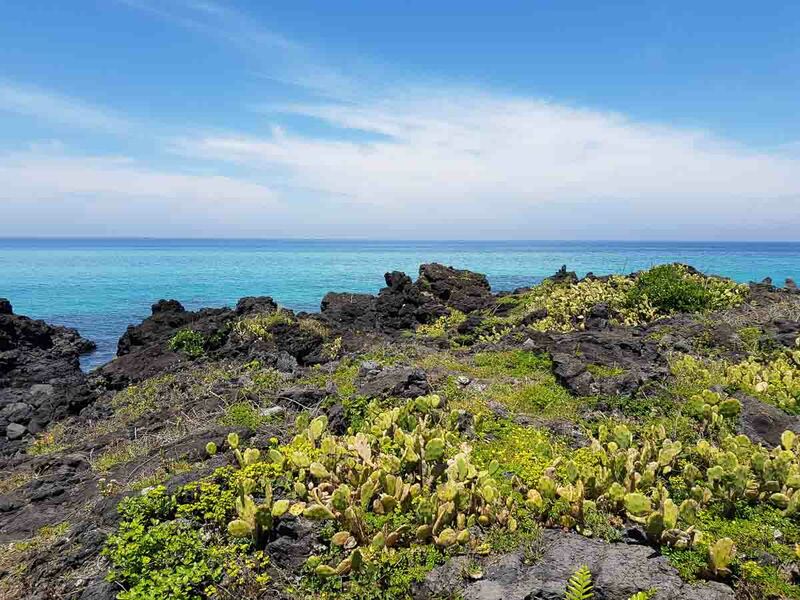 For adventurous couples, the island has loads to offer from hiking Jeju’s highest mountain Hallasan to all sorts of sports activities like diving, kayaking, paragliding, surfing and many more. Apart from all these activities, the island is filled with museums, theme parks, tea plantations, waterfalls and stunning beaches. One can easily spend months on the island without getting bored. Another great thing about the island is the delicious food. Especially the sea food and the Jeju black pork is a must try when going to Jeju. The pigs are locals to the island and have a special taste due to the preparation method. When visiting Jeju island it is highly recommended to rent a car as a lot of the touristic sights are located quite far from each other. Driving in Jeju is preferable because, even if public transport is available, going around by bus takes a lot of time. Book a hotel in the capital of the island, Jeju city. The city is just next to the international airport and is well connected to the rest of the island. 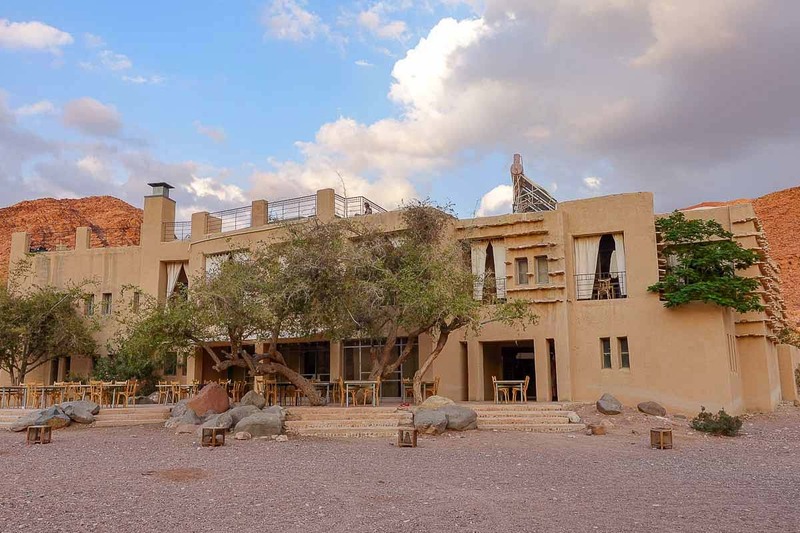 A perfect stop on your adventure honeymoon is Feynan Ecolodge in the Dana Biosphere Reserve in Jordan — which offers a tourist pass worth considering. Being an ecolodge, things are done a bit differently at Feynan. Given the isolated location, you will need to be picked up by one of the local Bedouin people to be transported for the last half an hour over rough, 4wd-only roads. You will immediately notice that at Feynan there is very little electricity: a few solar panels run some appliances, but all lighting is by candle, and there are no televisions here. With no fridges to keep meat cool, the menu is only made up of plenty of delicious, traditional, vegetarian food. While at Feynan Ecolodge, your days can be spent hiking the various wadis in the area. There are also experiences with the Bedouin people, such as learn how to be a shepherd for a day, or learning the traditions behind the local coffee blend. Sunset makes for the perfect time to take a short hike to a nearby ridge to catch the sun as it sinks into the distant desert. Each night, guests gather on the rooftop to learn a little about the millions of stars that can be seen from this location. A huge telescope makes gazing at the moon a magical and romantic experience, and the perfect end to two days spent in the desert. Couples looking for adventure on their honeymoon can look no further than the Gibbon Experience in Northwestern Laos. 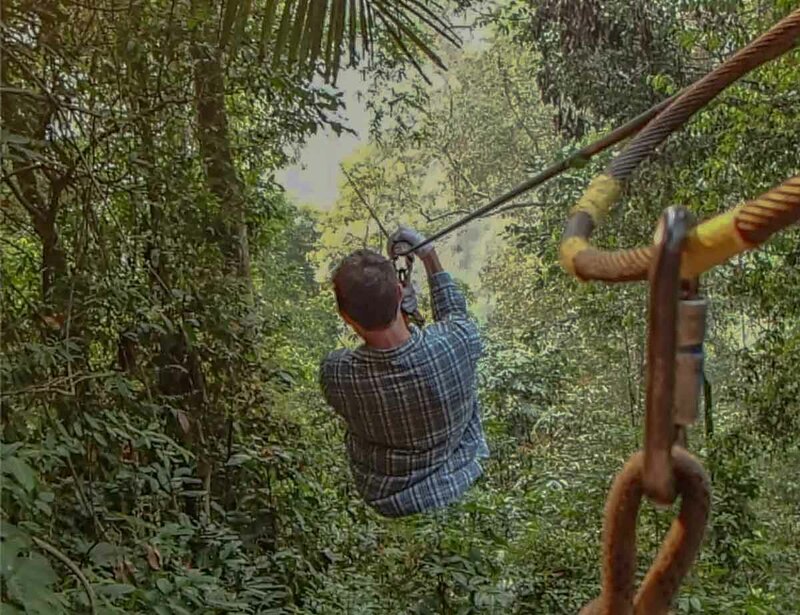 You’ll be like Tarzan and Jane, living in the jungle and using zip-lines to move from tree to tree as you explore the wilderness of this remote patch of Laos. In the process, know that you are taking part in a sustainable eco-tourism operation aimed at preserving the native habitat of the Gibbon ape. But conservation may be far from your mind as you scream through the forest, with nothing more than a thin cable to save you from plummeting down to the forest’s floor, far, far below. You’ll spend the night in a rustic wood treehouse and eat fresh Laotian cuisine while listening to the jungle come alive around you, and watching the sun melt into the canopy. The Gibbon Experience lasts for 3 day/2 nights and is fully catered: all you need to focus on is the adventure around you. The Gibbon Experience is accessible from Huay Xai, Laos, located on the Mekong River, a short flight from Vientiane. Stay at the Riverside Hotel in Huay Xai before and after the trip. Afterwards, you may decide to proceed to Luang Prabang, a UNESCO Heritage Site and home to some of Laos most mundane nights. Iran is full of interesting things to see and do for adventurous travellers, and it’s also a wonderful up and coming skiing destination, where you can conquer come world-class slopes for a fraction of what you would spend in Europe. The capital city of Tehran is located on the foothills of the Alborz Mountains, with peaks exceeding 5000 meters – the ski resorts themselves are around 3500 meters high, much higher than most places in Europe or the US. The main perks of skiing in Iran is that you’ll have to share the slopes with few others, and you’ll encounter lots of friendly locals – experiencing Iranian hospitality will definitely be a highlight of your time in the country. The easiest place to get to from Tehran for a day on the slopes is Tochal, which can be easily reached with a combination of city subway and cable car, taking about an hour to travel from the Velenjak Valley, north of Tehran, at an altitude of 1900 m, to the top station at an altitude of 3740 m. However, the slopes at Tochal are all very easy – serious skiers should instead consider the resorts of Dizin and Shemshak, about 70 km north, with some serious double-diamond black slopes. 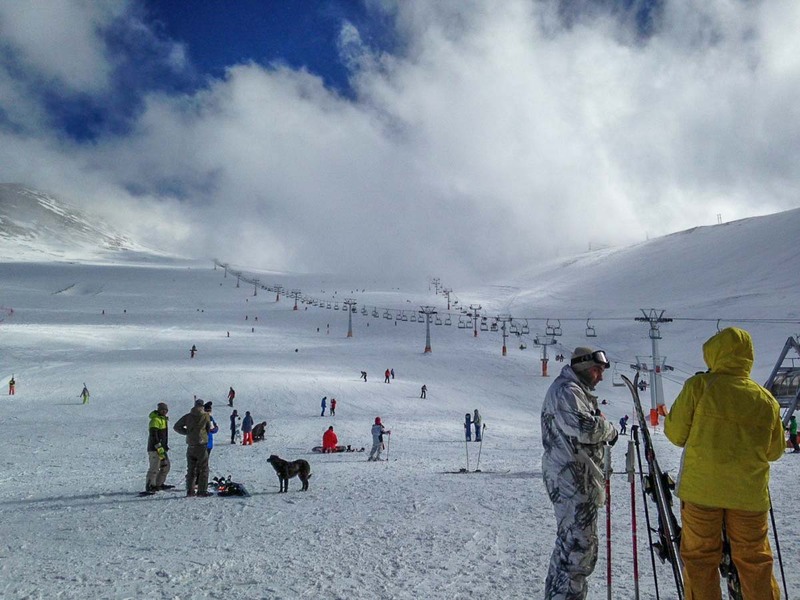 Lift prices are also quite reasonable, about €15–20 for a daily pass, and the Dizin ski resort offers a two-day package for €295, including accommodation, food, ski passes and round trip transfers from Tehran. After doing the touristy temple tours in Siem Reap, adventurous honeymooners should head out to explore Cambodia’s “Wild East”. Also known as Cambodia’s Green Triangle, Mondulkiri, Ratanakiri and Kratie are havens for intrepid explorers looking for authentic experiences in places that are untouched by tourists. 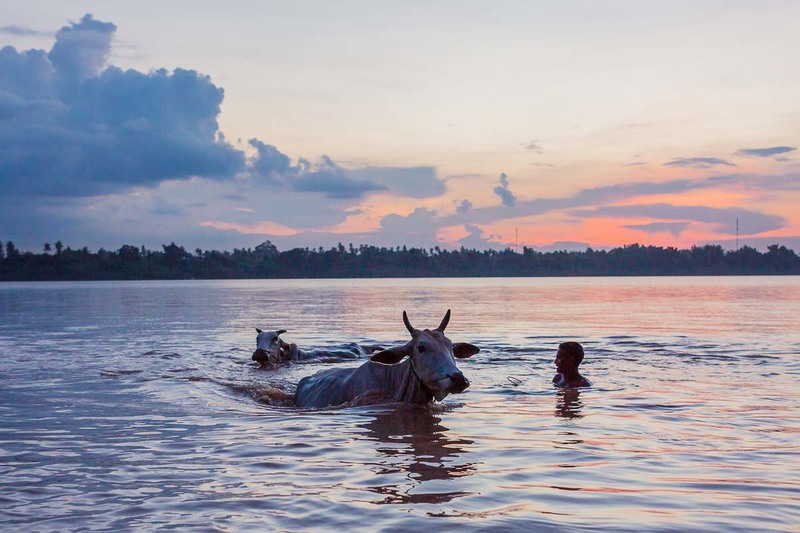 See the almost extinct Irrawaddy dolphins along the Mekong River in Kratie, gaze at the “Ocean of Trees” in Mondulkiri and visit the animist Katcha tribe in Koh Peak village along the Tonlé San in Ratanakiri. If you’re looking for a bit of lux in the wild, you’ll want to stay in the gorgeous 150 sqm Governer’s Suite of Terres Rouge in Banlung, Ratanakiri. One of the best parts about staying here is that lively owner Pierre-Yves will take you on a personal tour to see his elephants in the jungle. 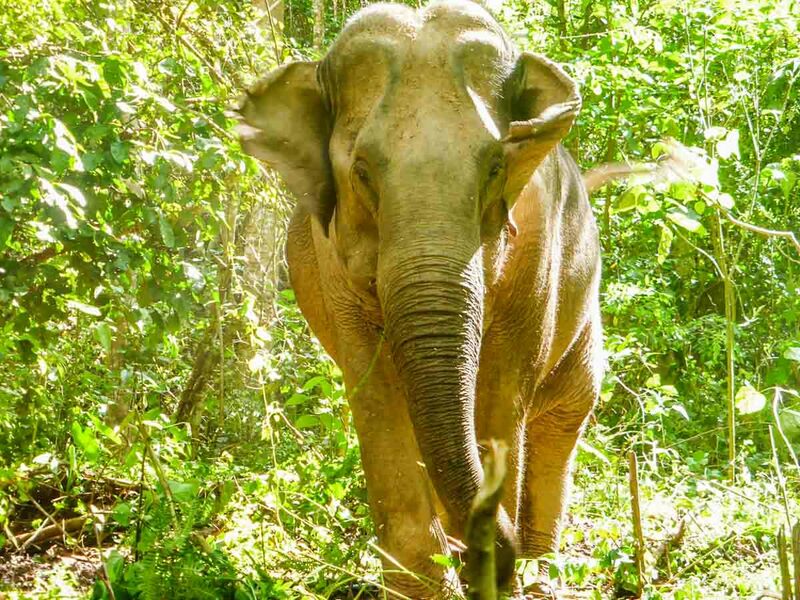 Different from the poor captive elephants in Siem Reap, Pierre-Yves has started a foundation called Airavata that has a mission to save all elephants in captivity and let them live a free and happy life. The hike to see the beautiful animals is roughly 3–4 hours with an option to attend the mahout school where you can learn to wash the elephants from their mahouts. A honeymoon here is perfect for the ethical tourist that is seriously looking to explore off the beaten track destinations. You can get into Banlung by flying into either Phnom Penh (9-hour drive) or Siem Reap (6-hour drive) and then taking a taxi. While there are buses and minibus taxis (for around US$8–20), I would highly suggest hiring a private taxi as the ride is quicker, safer and more comfortable. And, it is your honeymoon, so you should be traveling like royalty. The private taxi will cost you around US$200. All transport can be arranged by Terres Rouges. Accommodation and trekking: The Governor’s Suite at Terres Rouges will cost US$250/night with free wi-fi. Other accommodation options at Terres Rouges start from US$110/night. The Airavata elephant trekking is US$145 per person, transport & lunch are also included. Guests at Terres Rouges Lodge can take the trek for a discounted price of US$115 with a minimum of 3 people. Children (12 years and younger) get 40% off. 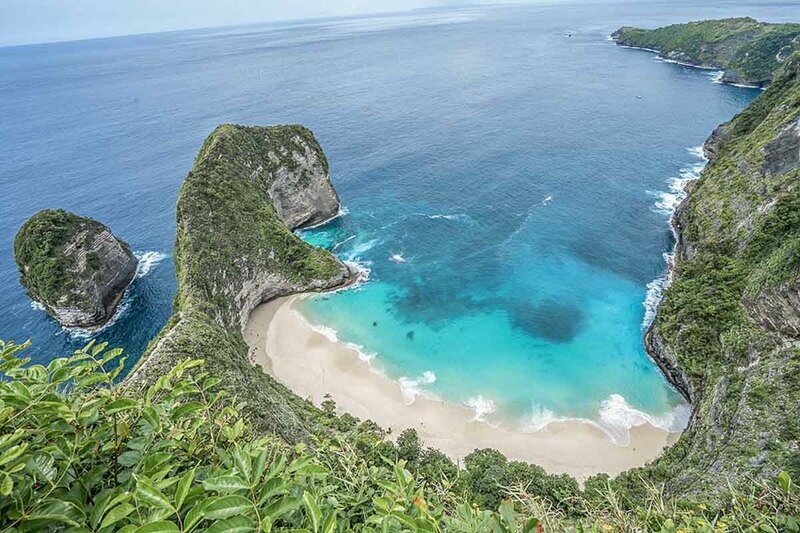 Newlyweds looking for a more off the beaten track honeymoon destination in Asia will fall in love with Nusa Penida. A small island off the Southeast coast of Bali, Nusa Penida is an adventure couple’s paradise. But don’t be put off by the proximity of its crowded neighbor, Penida is very different from Bali. Nusa Penida is much less developed, with most of its roads unpaved and only accessible by motorbike or rugged 4×4. It also has some of the best beaches in the whole country. You can’t miss Kelingking Beach, famous for its gorgeous view of the turquoise water and white sand coastline below. If you’re up for a real adventure you can hike the steep cliff down to the beach. Fair warning, this hike is not for the faint of heart. There are plenty of warning signs cautioning travelers and part of the hike is almost vertical with footholds carved into the steep trail. But if you’re game for an adventure, the reward is an incredible, almost empty beach below. The waves are really rough, so only get in the water if you’re a strong swimmer and have someone looking out for you. Other recommendations for adventure travel in Nusa Penida include Broken Beach, Angel’s Billabong and Crystal Bay. After a long day of exploring, honeymooners can find a relaxing beach bar and head back to their accommodation, of which there are many romantic options to choose from! 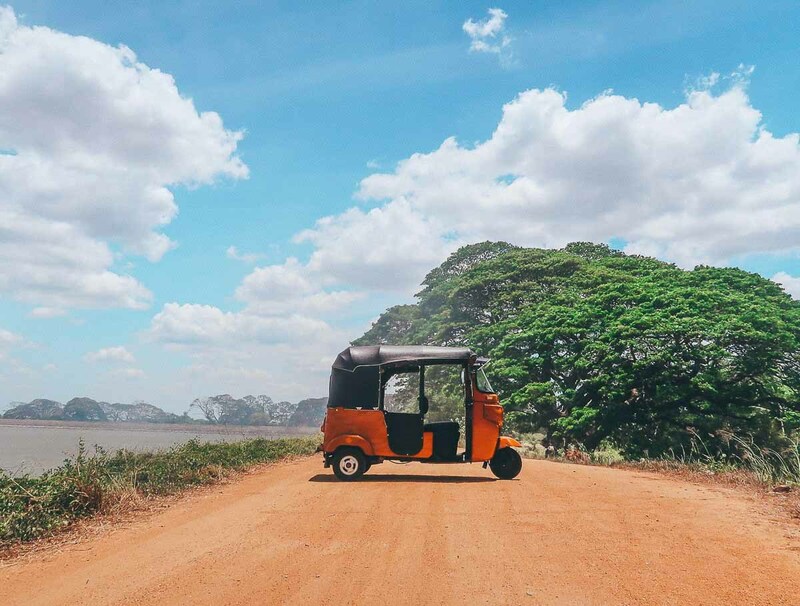 If you’re looking for a truly epic honeymoon idea in Asia, then why not spend 4 weeks driving a tuk-tuk across beautiful Sri Lanka? We did this back in late 2018, and it made for four of the best weeks of our lives. Tuk-tuks are surprisingly easy to drive, once you get the hang of it, and they are an incredible amount of fun. We visited almost two dozen different towns and cities, seeing everything we wanted to see, and more. Besides going to all the typical tourist spots, you have complete freedom over where you can go: for example, you could visit more rural spots such as Diyaluma Falls near Ella, or going on your very own tuk-tuk safari inside Yala National Park. If time isn’t an issue, I recommend that you spend a full four weeks in Sri Lanka. This is the perfect amount of time to travel all over the country and see all of its wondrous sites. You’ll find plenty of great quality hotels and hostels all over Sri Lanka. You can find a few different rental firms in Colombo and Negombo renting tuk-tuks, ranging anywhere from $USD14–30 per day, depending on how long you choose to rent for. The route we took touched Colombo, Negombo, Wilpattu, Anuradhapura, Mullaitivu, Trincomalee, Sigiriya, Dambulla, Kandy, Nuwara Eliya, Ella, Arugam Bay, Mirissa and Unawatuna. A dream destination for nature-loving honeymooners, the Danum Valley combines 5-star luxury with remote wilderness. The exquisite Borneo Rainforest Lodge is the only lodge located inside Bornean primary rainforest. In Danum Valley, every day is filled with magical wildlife encounters, decadent meals, and pampering. 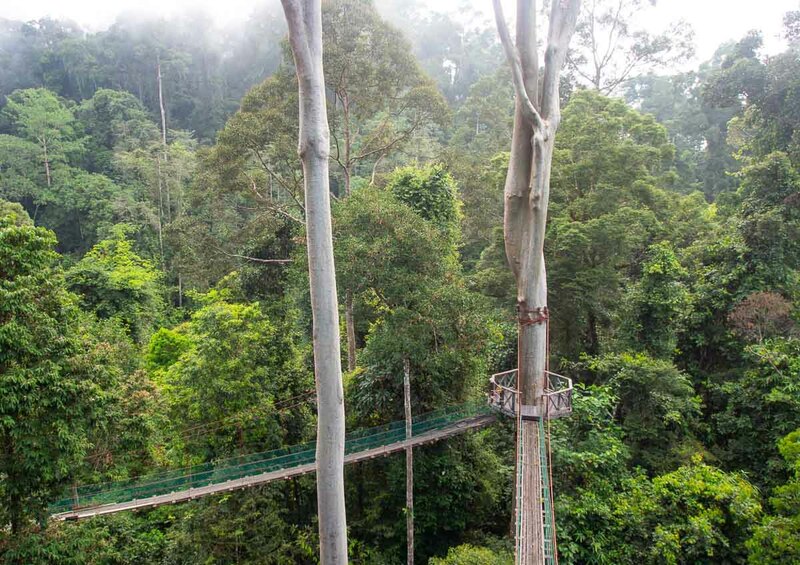 Walk hand-in-hand on a world-famous canopy walkway before the first rays of the sun, and see the morning mist wrap the rainforest in a fairytale gown. Fill your days with day hikes and night drives to spot wild orangutans, tarsiers, giant flying squirrels, and other exotic creatures. The best part: you will have the wilderness all by yourself. We hardly ever saw other hiking groups. On top of orangutans, during our three-day stay in Borneo Rainforest Lodge we were lucky to see many rare species, such as Bornean pygmy elephants. Borneo Rainforest Lodge has only 30 luxurious villas, so it never feels crowded. Four-day all-inclusive packages start at $1400 per person. The rates include 2-hour return transfers in air-con jeeps from the nearest town, Lahad Datu, which is served by internal flights from Kota Kinabalu. The road transfers are magical, too: we saw the rare pygmy elephants on the way! A camel safari from Jaisalmer is the perfect honeymoon activity for adventurous couples because it combines adventure and romance. The day starts with a jeep ride in the dark to a desert camp, where breakfast is served by a fire surrounded by camels and trees. After food, mount on your camel for a ride through the Thar Desert, past fields waiting for the monsoon rains, and small tribal and mixed caste villages, including Rajput. You can dismount and walk into the villages and family homes, where your guide will introduce you and show you their guest rooms and goats. Spend the afternoon relaxing under the shade of a tree until the worst of the mid-day heat has dwindled, and then hop back onto your camel to ride to the sand dunes and enjoy a spectacular sunset. At last, you’ll unpack yourbedrolll and sleep snug under the stars. In the morning, mount back on your camel for more riding through the desert, and a long leisurely lunch, before ending back at the desert camp late in the second afternoon. Jaisalmer is in the far western corner of India, near the Pakistan border and it has no airport, but it’s at the end of the train line from Jodhpur. Buses from Jodhpur and Delhi are also available. Many agencies in Jaisalmer arrange camel safaris. Most offer two days/one night packages, but shorter (one day) or longer (up to seven days) trips are possible. Be very clear of what is exactly included in the price, so that there won’t be any surprises. I used Adventure Travel Agency, and we went to the isolated Khalaya sand dunes: we were the only two people there, in addition to our guide. The cost is 2,500 rupees per person, but we did it as a private tour, paying 3,100 rupees each. 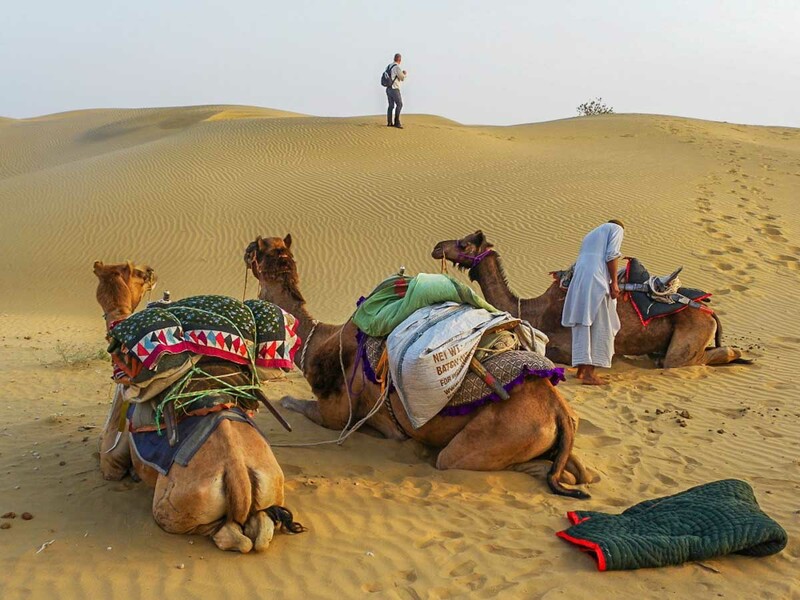 Other Jaisalmer-based companies that go to various isolated dunes include Thar Desert Tours (3,000 each plus 300 rupees for a tent if you don’t want to sleep under the stars) and Jaisalmer Camel Safari (2,500 rupees in a group or 3,500 per person for a private tour). These trips all start in the early morning on day one, and finish in the late afternoon on day two. The most popular dunes near Jaisalmer are the Sam Sand Dunes, and there are desert camps for glamping, though this is not the same isolated experience that the other companies offer. Camel safaris in Rajasthan’s Thar Desert are also available from many other towns including the small town of Kuri near Jaipur, Jodhpur, etc. Republic of Georgia’s Upper Svaneti region is made for adventure lovers. Nestled in the Greater Caucasus, the mountain range that separates Georgia from Russia (and Asia from Europe), Svaneti is one of the most spectacular high-altitude landscapes in the region. In my opinion, Svaneti offers all the majesty of Switzerland but for a fraction of the cost, and with far fewer people to have to share it with. Trekking is a great way to experience Svaneti. 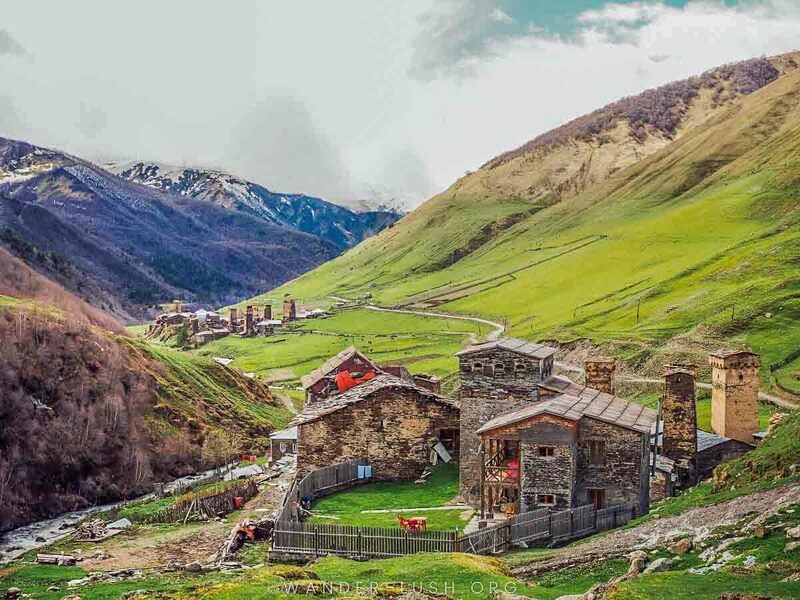 The most popular route is a multi-day hike that links Mestia, the biggest town, with the tiny village of Ushguli. The Caucasian Trail produces maps and trail guides for the four-day trek. Accommodation is provided in villages along the way, and you’ll get to reap the benefits of Svan hospitality, which usually involves a lot of bread, wine and chacha (Georgia’s answer to grappa). For the less intrepid, there is also a range of shorter treks. Using Mestia as a base, hikes to Koruldi Lakes at the foot of Mount Ushba, and to Chalaadi Glacier, can both be done within a day. Upper Svaneti is often cut off in winter. The best time to visit for trekking is in late spring or summer (preferably June to August), when temperatures are pleasant and the wildflowers are in bloom. Samegrelo-Zemo Svaneti is located in north-western Georgia. The closest international airport is in Kutaisi, with road connections to Mestia available from Kutaisi, Tbilisi and Batumi. There is also a small airport in Mestia with daily flights to major cities within Georgia. To make the most of your trip, I recommend staying at least four nights, depending on how much trekking you want to do. There is a wealth of family-run guesthouses and lodges to choose from in both Mestia and Ushguli. 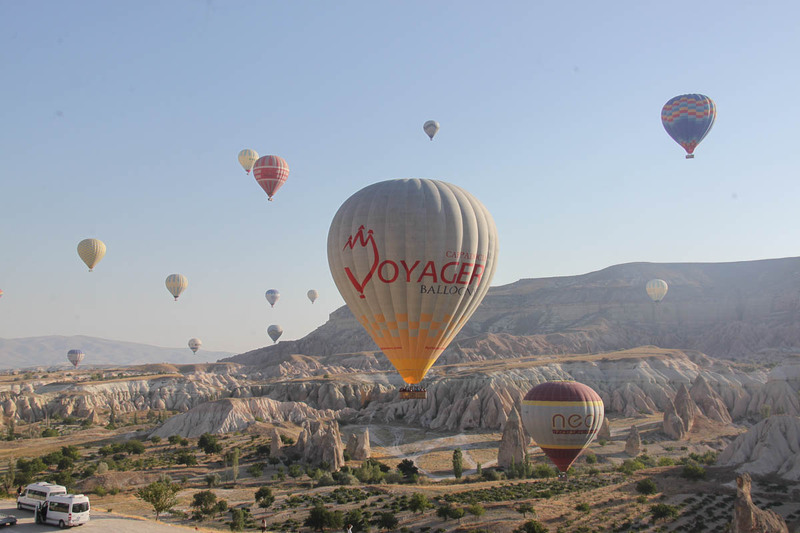 Imagine waking up to hundreds of hot air balloons taking to the skies as you sip Turkish coffee and a full breakfast. All after having spent an entire night inside a cave hotel that is literally constructed underground. The next morning, you’ll step into the same hot-air balloon to see the unique rocky landscape of Cappadocia with a bird’s eye view. Once your ride is over, you can celebrate your adventure with some non-alcoholic champagne to make the experience even more memorable. Spend the rest of your day admiring the rocky outcrops from ground level at the Goreme Open Air museum, and traveling a little farther to see the underground cities of yore. And since you’re on your honeymoon, don’t shy away from visiting the ‘male’ rock pillars. Getting to Cappadocia is fairly easy as there are frequent flights from Istanbul to Goreme. Many hotels will offer airport pick-up for a small fee. We stayed at Vista Cave Hotel and really recommend it over others as the owner is super helpful, and his wife makes the best breakfast. Schedule to spend at least three full days in Cappadocia if you plan to explore the region properly. Additionally, having an extra day is helpful in case weather patterns don’t allow hot-air balloons to take off on your scheduled date. Want to climb a volcano and then relax on the beach for an amazing honeymoon? Head over to central Flores in Indonesia for an epic and adventurous experience. Kelimutu is located 1.5 hours from Ende and 3 hours from Maumere airports. 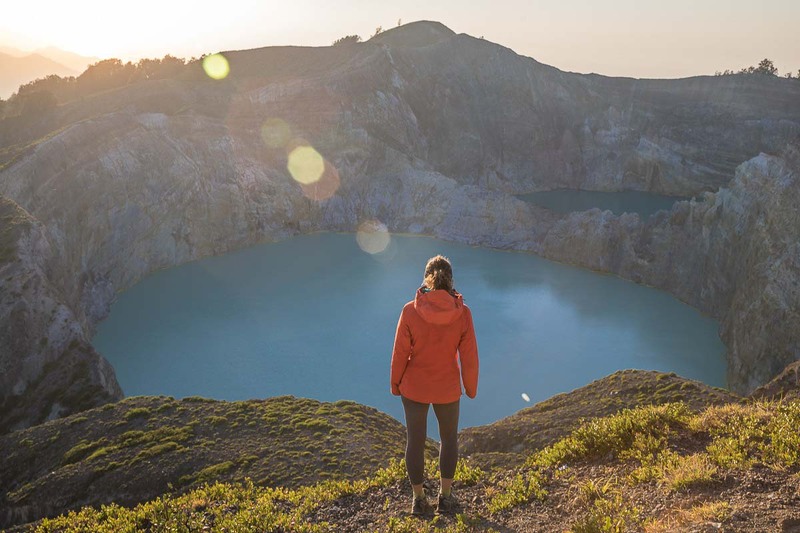 Kelimutu is a volcano with three separate crater lakes. The lakes change colour depending on the oxidation-reduction status of each lake. The colours range from deep red, deep blue, black, and turquoise. The lakes and the colours are stunning. Kelimutu is great to visit during sunrise. The best viewpoint is at the top overlooking the two main lakes. After sunrise stick around and hike the area for some amazing photo opportunities with fewer crowds. If feeling super adventurous, there is a hike from the top of the Volcano to Moni. On the way down there are waterfalls and even hot springs to soak in. Be sure to go during the dry season between the months of May to September. From there head to Koka Beach located 2 hours from Moni. It is a beautiful place to relax and get some sun. The accommodation is basic but the crystal clear water and slow-paced vibe are a perfect way to chill out for a few days. This rural homestay and trek to find elephants roaming freely in the forest make for an incredible honeymoon adventure. The hike takes several hours and you have the option to camp in the forest overnight, so that you’ll have plenty of time to watch the elephant herd. We loved following the pachyderms and being able to see them live so happily in nature. It was wonderful to see Asian elephants safely up close and to support them living in their home environment — and also support a small village with our visit. This experience is conducted by the Mahouts Elephant Foundation, which created the program in conjunction with the local community. Together they walked the elephants out of work camps in Chiang Mai, all the way back to their original home. Huay Pakoot is four hours’ drive from Chiang Mai, and the Foundation will collect you from the city, providing all transportation logistics. The experience usually lasts for 4 days/3 nights, but you can also stay longer by arrangement. Several families provide homestays, and our lovely hosts Por Yor and Suda had a separate dwelling next to their home which we enjoyed staying in. Tibet is a fascinating part of China that very few foreigners venture into, mostly because it tends to be expensive and requires a lot of planning, both restrictions which are easily overcome when planning a honeymoon. The country has a diversity of temples and culture, heritage as well as trekking and hiking opportunities which make for a varied trip and, while there are not that many high-end accommodation options outside of Lhasa, the landscapes and the fascinating heritage make up for a really special honeymoon destination. 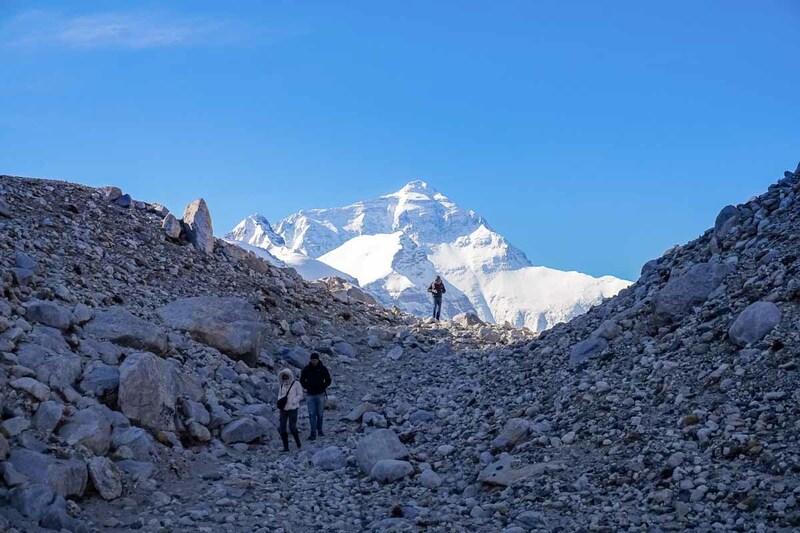 You can also drive to 5,150mt above sea level, from where you can hike the last few hundred meters to see Everest Base Camp from the Tibetan side and spend the night in a traditional Tibetan tent to see the sun set and rise over the world’s highest peak. You cannot visit Tibet independently but need to go accompanied by a tour company who will take care of getting all the permits for you and booking a driver and all accommodations. Indeed, you will need to get a Chinese visa, and then a separate permit to visit Tibet. For Base Camp, there’s also another additional permit required. Tibet doesn’t come cheap because it cannot be done independently, and options are very limited. Arrive in Lhasa on the highest railway in the world, stay at the Shangri-la or St. Regis Hotel in Lhasa, and make sure to spend a night at Base Camp. Consult your doctor on altitude sickness medication as the altitude sure is one of the most relevant concerns, and you don’t want to get sick while at Base Camp and have to descend. The Baliem Valley is one of the most off-the-beaten-path, amazing and culturally fascinating places in the world. Wamena is the capital of the region and the starting point for many trips and activities. You can visit traditional villages and local markets, take multi-day hikes, try your hand at horseback riding, and learn about the Papua culture. 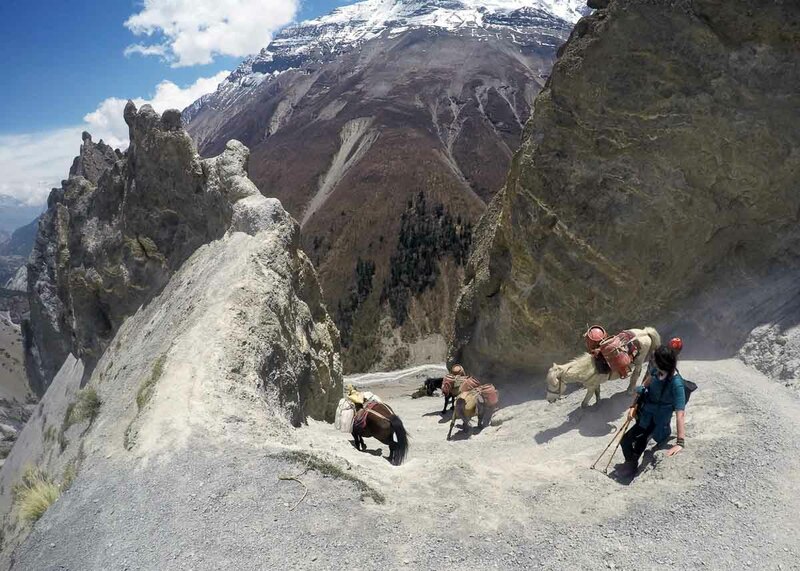 The most popular activity is definitely the hike to the Baliem Valley. This trail, which can be completed in 3–5 days, will take you along huge canyons and remote villages inhabited by the local tribes known as Dani and Yali. These people live in wooden huts and wear nothing more than loincloths. The island of Papua is dividedinton two parts: the eastern part belongs to the independent country of Papua New Guinea, and the western half is part of Indonesia. There is no paved road to Wamena, so you’ll need to fly from Jayapura. Once in Wamena, you can take a minibus to Kurima, the starting point of the trail. The ride will cost you only a few dollars. You’ll find several villages along the hike, and you can stay in local home-stays. The price for accommodation and food is around $20 per night. The local people don’t speak any English, so although the trail is pretty easy to follow, you’ll need to get a local guide to help you communicate with them and make the best of this unique experience. 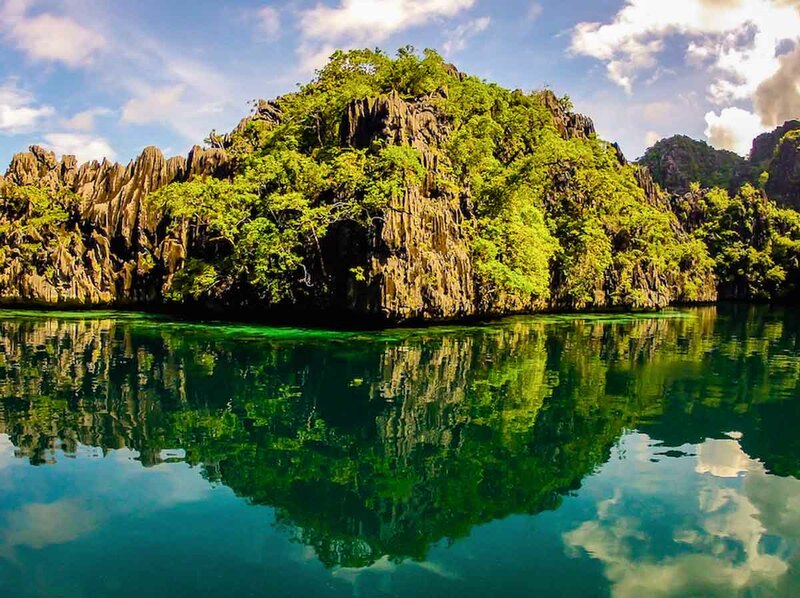 If you can’t find romance and adventure in Coron – the idyllic part of the northern Palawan province that has been named “Best Island in the World” by Travel + Leisure readers on more than one occasion– you’re not looking hard enough. Coron, which includes both the island and the city after which it was named, has plenty of unspoiled beaches, dynamic karst limestone landscapes, picture-perfect waters, and stunning scenery to keep couples loving life from sun-up to sunset. And if it’s an outdoor activity you seek, there’s climbing 723 steps to the top of Mount Tapyas, snorkeling with dugongs (a cousin of the manatee), Scuba diving with sea turtles and spotted rays, and island-hopping tours aplenty. The area is filled with wonderfully romantic hotels, from Coron town’s Funny Lion to Coron Island’s 5-star Two Seasons. But our favorite was Club Paradise, a secluded private island resort located just off the coast,: It had a secluded beach, tons of wildlife (including monitor lizards and tropical birds), and incredible snorkeling right from the shore. Getting to Coron is easy: Several airlines offer direct flights to the Busuanga Airport from Manila, then for around P150 a person you can take an hour-long jeepney ride to reach Coron Town. It’s definitely a trip you’ll never forget, and Coron proud to be a place so nice, we went there twice! DO YOU WANT TO GET MORE INSIDER TIPS ON TRAVELING ASIA'S BACKROADS? Ah so many great destinations to travel to! Thanks for including Taiwan in Marco. I would love to visit West Papua in Indonesia and try out skiing in Iran since I have only visited the place in Fall.